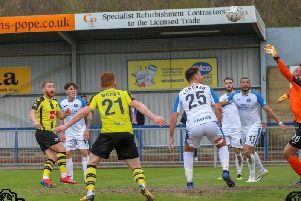 Harrogate Town defender Warren Burrell hit a hat-trick to help his side see off Aldershot at the CNG Stadium on Saturday. After 48 games without a goal, the centre-half broke his duck in some style as Simon Weaver's team ran out 4-1 winners over their struggling opponents. Click on the video above to watch Burrell's post-match reaction.